2 Rides 2 The Movies! IMPORTANT UPDATE: Please note that the deadline for this campaign has already passed, and we are no longer giving out incentive rewards for this campaign. If you think GrabHitch is just another car sharing service, think again! GrabHitch is powered by people. It is not just about making a profit, it is also a way to save on travel costs and meet new people. Thats what we call social travelling! GrabHitch is not an on-demand service and it is very different from a taxi service. How so? Because GrabHitch drivers are private car owners, driving their own cars and going the same way you are! In fact, they are just giving you a lift (tompang!) to your destination in exchange for a fee. That’s why we recommend that you make a booking at least 2 hours in advance to increase the odds of you getting a ride, so that drivers who are going the same way have ample time to plan their routes and pick you up along the way! New to GrabHitch? Make sure you take note of these Pro-Tips! Tip 1: Be prepared. Make a booking in advance. The earlier you book, the more drivers will be able to see your route, and the higher your chance of getting a picked up! Tip 2: Be cool. Sit in front. Make friends with your driver! Always initiate conversation when you get a hitch ride, no one likes nasty passengers! 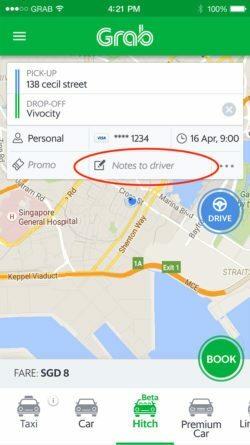 If you have extra friends or bags, make sure you indicate in the ‘Notes to Driver’ function. Indicate how many passengers you want to take with you on the ride so that your hitch driver will know in advance if he can accommodate to you! Bookings have to be made between 14 Oct 0:00hrs 2016 to 28 Oct 23:59hrs 2016 to be eligible for the promotion. Email us at grabhitch@grab.com with the Subject: Ride2Movies at the end of the promotion to claim your ticket. The movie ticket redemption results will be tallied after the promotion period has ended (31st Oct 2016 onwards). The movie ticket is non exchangeable, nor transferable for cash or Grab credits. GrabHitch reserves the right to change these Terms and Conditions at any time without prior notice.